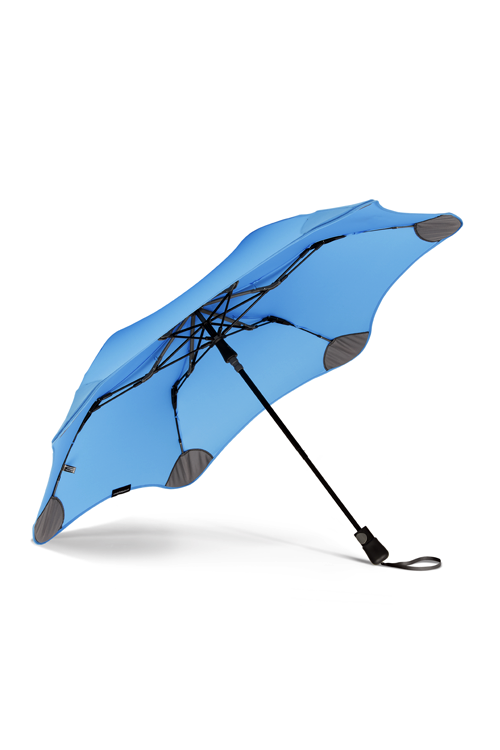 The Blue XS METRO BLUNT Umbrella is the creation of kiwi Greig Brebner. Greig was tired of seeing blown out umbrellas in rubbish bins and set about finding a solution. Thus, BLUNT has become an awesome international success with people all over the world loving the elegant engineering and fabulous design! A major flaw of conventional umbrella design is that in even light winds the fabric can tear away. As a result, the whole structure collapses and the umbrella heads straight to the landfill! Therefore, the BLUNT solution is a uniquely tensioned canopy combined with a flatter aerodynamic profile. This revolution in umbrella design also eliminates any sharp edges and weak points. As the BLUNT canopy unfurls the additional DOUBLE STRUTS redirect the user’s effort into the specially designed FLOATING RIBS. These ribs are telescopic, and reach out like fingers stretching into a glove. They transfer the opening force into the patented BLUNT TIPS on the end of each rib. The tips then open like miniature umbrellas in their specially designed pockets, evenly distributing the tension right to the edge, where it is most needed. The result is an unflappable aerodynamic structure that sits effortlessly in the wind and provides maximum control, even in the most demanding weather conditions. Watch videos of the BLUNT in action here. Overall, the Blue XS METRO BLUNT Umbrella is the ultimate balance of portability and performance for a compact umbrella. This 2-stage model is the strongest collapsible umbrella around. It is the go-to choice for urban dwellers, folding up, and sliding into its sleeve so that it fits easily in your bag – making it easier to carry around than a full sized stick umbrella. The Yellow XS METRO BLUNT Umbrella, designed in New Zealand, is a revolution in umbrella design creating the ultimate defense against the elements.